Ryan Gosling schools Steve Carell in the world of romance this November. In an early announcement to retailers, Warner Brothers has revealed 'Crazy, Stupid, Love' is headed to Blu-ray on November 1. The well-received romantic comedy co-stars Julianne Moore, Marisa Tomei, and Emma Stone. Specs have yet to be revealed, but the release will be a Blu-ray/DVD/Digital Copy combo and will include: Steve and Ryan Walk Into a Bar featurette, The Player Meets His Match featurette, and Deleted scenes. Suggested list price for the Blu-ray combo pack is $35.99 and a movie-only edition will also available for $29.99. 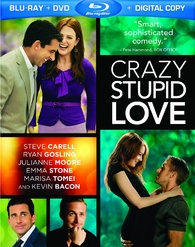 You can find the latest specs for 'Crazy, Stupid, Love' linked from our Blu-ray Release Schedule, where it's indexed under November 1.